Are you still with us? You're nearly half-way you know. Looking ahead, you're about to reach the tippy top height of the Challenge roller coaster. After that it's all downhill. Sounds easy, doesn't it. But I can empathize. That last mile of the journey can sometimes seem like the longest and then before you know it--it's over and done with. Hang in there with your postings and keep trying to visit as many other blogs as you can. 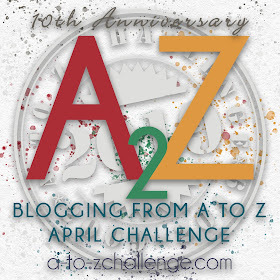 And as you look even farther ahead, past those last tricky letters and finally the big "Z" you will hopefully see new blogging friendships in your future as well as an inspired sense of self-confidence. Stick with it bloggers! You've got this and we're rooting for your success. If you can finish successfully, then looking ahead I predict you will be pleased with your accomplishment. You might even start looking ahead to next year's Challenge. The post for letter "L" is LOTUS. Yes, nearly halfway ;) K seems to be a tricky letter for some themes, and for others, there are not a lot of alternative and we found to have the same word! How funny! I remember from the last time I did this. Somewhere around M, N, or O... that was the hardest part. But it really does start to get easier after that, once you know that Z is in sight! MMmmmmmmm Next year . . . I wonder if anyone has done the A to Z of Cheese. Actually that is far to sensible for me, but if anyone is thinking OOooooooo then I say go for it. After all everyone loves Cheese. L is for Love, Simon! 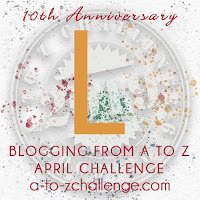 L is for Living with the Land! Love, love, LOVE this challenge! I'm still in on two blogs (along with one blog's instagram account). It's been a challenge but it's fun too. I didn't expect to but on the poetry blog cactus haiku I've started writing the haiku/senryu with all the words (except prepositions) in the letter of the day and learning new words at the same time. Loving it. I was looking forward tio the 1oth anniversary of the challenge but personal reasons have robbed me of something I enjoyed doing each year. I'm enjoying doing this challenge on Instagram this year. It has challenged me to think of pretty ways to display books. I'm looking forward to doing it again next year. Finally getting smart have all my posts written and ready for posting. Makes it so much more fun to visit other sites. My post for "L" is linked below. I'm loving the extra visits to new bloggers (new to me, that is). 100 emails to read but trying to resist deleting them. And still got X, Y and Z to write.